KU Campers enjoy the Giraffes at Fossil Rim in Glen Rose. Technology classes are offered to adults of all ages. Masterpieces are made in our summer Adventures in Art Camp! Students making a shelter during Survival Tactics Camp. Summer Basketball Camp for boys and girls in Grades 1-8. Horsemanship is one of ComEd most popular classes for kids. Learn a new skill like these students learning to quilt. KU Summer Camp develops friendships. Students build Lego structures in Lego Logo Camp. Cake Decorating classes are offered through Community Ed. Our Tone-N-Trim class is a great way to keep in shape and get healthy! Agility is a big part of the summer football camp put on by the Texas Bullets. Adults have the opportunity to learn a new trade in our Welding classes. KU Summer Campers enjoy pool time during the summer heat. KU Summer Campers field trip to the Fort Worth Museum of Science and History. Oil Painting in the ComEd Adventures in Art Camp during the summer. Stained Glass classes are a big hit! Community Ed offers Women's and Co-Ed Volleyball Leagues year round. Knitting is a great hobby to learn! The summer Strength and Conditioning Camp (SAC) is beneficial to athletes in every sport. The Mission of the WISD Community Education Department is to teach, challenge, and inspire students of all ages in our community to succeed in the global community as life-long learners. 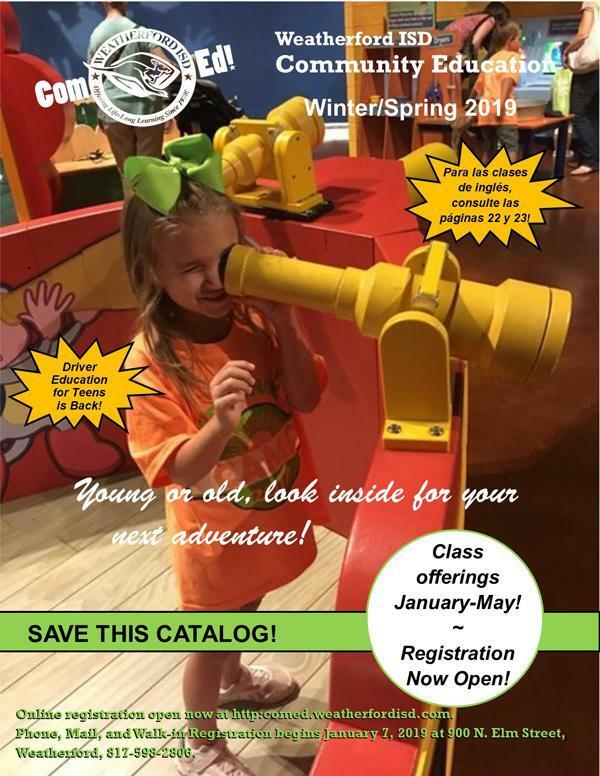 Watch for the catalog below to arrive in your mailbox soon! viewed in its entirety by clicking on the link at the bottom of this page! 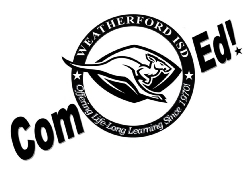 is now beginning its 49th year serving Weatherford and Parker County! Click "HERE" to like us on Facebook for updates on all our programs! Click "HERE" to visit our registration site.